The griffin is a fascinating mythical creature whose roots reach from western Europe to the Eastern edges of India and beyond. In any mythology, the griffin is portrayed as a mix between an eagle and a lion. In all cases, this creature is shown as having the head of an eagle and the body of a lion, but from there the other specific features are in debate. As any regular visitor to this site has probably figured out by now, I don't like to spend too much time debating the different interpretations of every myth. Instead, I usually go through several of the most common or popular interpretations and bring you a single, amalgamated truth and stick to it. This will be no exception. The most common portrayal of the griffin in mythology is a creature with the body and regal, kingly mythical creature who commanded deep respect. Griffin mythology reads a lot like dragon mythology in that griffins were thought to be very wise and wily characters who spent a good deal of time seeking out and guarding gold and treasures. Other legends have the griffin as a trickster, much like the Sphinx, who would challenge people with riddles in a contest of wits. The winners would get to keep their lives and treasures, and the losers... wouldn't. The Sphinx also has the body of a lion. Historian and folklore expert Adrienne Mayor has suggested a possible origin of griffin mythology that I find quite compelling. She points to several fossil findings of the pentaceratops - a dinosaur from the Cretaceous period - that were located near known gold veins as being influential in the belief in griffins. The pentaceratops had a beaked face with a four-legged body. Anyone digging for gold in an area with these bones would find a creature whose bones looked very much like what one would imagine a griffin's bones to look like located near their gold vein. From there, it's not hard to figure out why people would imagine a griffin looking as it does and being known for digging for and hording gold. As they represented both wisdom and power, griffins were commonly associated with strength in war, thus being an obvious choice for many coats of arms from ancient to medieval families and armies. 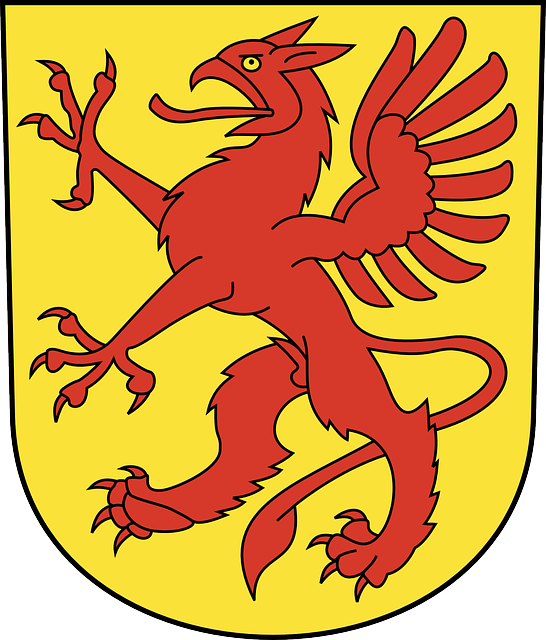 The Republic of Genoa used the griffin as a symbol of its seafaring power on all of its ships in the Middle Ages. As with most monsters, the griffin has ties to ancient Greek mythology. Specifically, it was said that a griffin pulled the chariot of Apollo (Greek mythology), the sun god. This would be appropriate, as the griffin was thought to be stronger than an ox or a horse, and had the ability to fly, thus carrying the sun god to and from the sun and earth. Apollo often also represented wisdom in the form of knowledge, which is also a characteristic of the griffin. Other than this specific example, it's hard to find legends and myths about specific griffins. What I mean is, griffins are well-known in the general sense of being mythical creatures, but don't appear to have one or two standout characters in mythology. Though they were thought to speak, there are no named griffins of significance. For being as widespread in legend as they are, this is a bit surprising. That is, until you consider that the griffin was more of a symbolic creature than one used thoroughly in legends and folklore. In this sense, it seems more appropriate that this mythical beast would maintain some level of anonymity, respect, and mystery. Return from Griffin Mythology to the List of Mythical Creatures.